On June 10, Royal City Rag focused on Guelph Creative Arts Association’s annual outdoor show and sale Painting on the Green. The show takes place this coming weekend, June 13-14 at The Arboretum Centre at the University of Guelph. The President of the association, Bruce Homer, joined us live in the studio. There were also great taped interviews with painter and printmaker Margaret Peter and crafter Patti Rainbow. The two-day art show and sale is one of the oldest annual outdoor shows in the province, now in its 48th year. The public is invited to come and see original painting and crafts, watch art demonstrations, and take the opportunity to purchase works by local favourites and emerging artists, all in a beautiful outdoor setting. On Saturday the show runs from 11.00 a.m. to 5.00 p.m., and on Sunday from 11.00 a.m. until 4.00 p.m. The announcement and presentation of awards for the best works in the show will take place Saturday at 3.00 p.m.
On Sunday, the hammer dulcimer and guitar duo from Burlington, the Playford Players, will be entertaining between 1.00 p.m. and 3.00 p.m. Admission to Painting on the Green is free, although donations to support the work of the GCAA will be gratefully accepted. Please note that the Arboretum now has a new entrance off College Avenue, west of Victoria Road. Due to pending construction, using Victoria Rd to access College Ave is recommended. Royal City Rag on May 20 had a distinctly environmental slant. We started off with a great interview with University of Guelph Arboretum manager Ric Jordan and Guelph Urban Forest Friends‘ Norah Chaloner and Judy Martin. Trees in Guelph need far greater protection than afforded by the current city bylaw. Guelph has far less than the ideal 40% tree canopy cover recommended for cities. A strategic plan for Guelph’s urban forest has been in the works at city hall for over a decade now yet progress has been slow to say the least. On March 30, Ric Jordan made a presentation to the Community Development and Environmental Services Committee of City Council on behalf of Guelph Urban Forest Friends (GUFF) to remind the city that the time for inaction on the Strategic Urban Forest Management Plan is now past. We need an interim protective tree bylaw now. We need an independent urban forestry department. We need a certified forester to direct tree, shade and water interconnection, public education and enforcement of tree maintenance and protection. We need an urban forest advisory committee to support this department. In the meantime more and more trees are lost from our urban landscape. For more on this important issue, visit the Guelph Urban Forest Friends website at www.guffguelph.ca. Please consider signing the GUFF petition. Download and print the petition. Encourage your friends and neighbours to show their commitment to Guelph’s trees by signing it. Return complete petitions to GUFF, under the Big Umbrella, at the Guelph Farmers’ Market. Later in the show, Karen McKeown from the City of Guelph joined us to discuss the city’s Healthy Landscapes – Landscape Assessment program. The Healthy Landscapes program provides great information on how to develop and maintain a beautiful garden without hours of maintenance and ritualistic pesticide use. For more information on the program, book an assessment or get your questions answered e-mail Karen at mckeown@guelph.ca or call 519-822-1260 Ext. 2109. On Saturday June 20 from 9.00 a.m. – 2 p.m., Healthy Landscapes will be running a Lawn Care Day in the back parking lot at the West End Community Centre. This is your opportunity to learn all about lawn care with advice on weed and insect control. Representatives from local lawn care companies and businesses will be present. You can also bring in your old gas powered lawn mower and receive a rebate on a brand new SOLARIS – SP21HB – High Performance Self Propelled Cordless Electric Lawn Mower. Another interesting event coming up, and one that ties both parts of the show together, is the A Bus Tour Of The Trees of Guelph on Sunday June 21 from 1.00 -3.00 p.m. The tour, featuring Sean Fox, forester at The Arboretum, will visit some of the outstanding trees in our city. You will also be able to learn what trees will work best in your yard, and how to look after them. Pre-registration is recommended as space on the bus in limited. Email healthylandscapes@guelph.ca or call 519-822-1260 Ext 2109. We’ll be talking about Healthy Landscapes on Royal City Rag on May 20. Karen McKeown from the City of Guelph will join us to discuss the city’s Healthy Landscapes – Landscape Assessment program. 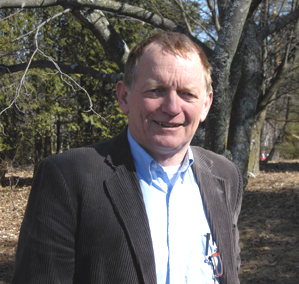 We’ll also be replaying a wonderful interview with Ric Jordan, manager of The Arboretum at the University of Guelph about the plight of our urban trees, an important part of any healthy landscape. Don’t miss the show. It promises to be a good one. 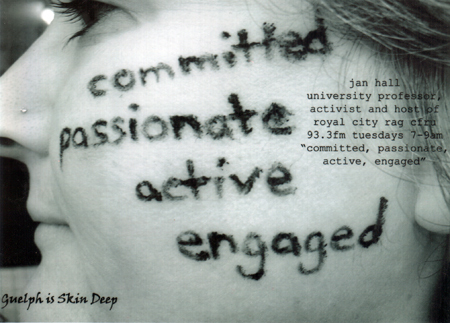 Wednesday, May 20 from 6-7 p.m. on CFRU 93.3fm, Guelph’s Campus Community Radio Station. Listen live on CFRU 93.3fm or after the fact via the website or CFRU archive. Royal City Rag on March 25 focused on environmental issues including Backyard Bounty, activites for Earth Hour 2009 (March 28) and why Guelph’s urban forest needs greater protection. We started the show with some interviews recorded at the launch of Backyard Bounty, Guelph’s urban farming initiative, at the Evergreen Centre on March 22. Interviewees included Guelph singer-songwriter and community activist James Gordon, Sally Ludwig from Transition Guelph and Shannon Lee Stirling from Backyard Bounty. Transition Guelph will be having a candlelight potluck at the Guelph Youth Music Centre on March 28 between 7.30 and 10.00 p.m. to celebrate Earth Hour 2009. Bring a friend or neighbour, a light dish (hors d’ouvres, snacks, dessert, finger food), and a candle in a safe holder, flashlight or lantern, and enjoy good food, good company and live unplugged music! For more information, visit: www.transitionguelph.org/earthhour . Later in the show we played an interview recorded at the University of Guelph Arboretum with manager Ric Jordan and Guelph Urban Forest Friends‘ Norah Chaloner and Judy Martin. Trees in Guelph need far greater protection than afforded by the current city bylaw. Guelph has far less than the ideal 40% tree canopy cover recommended for cities. A strategic plan for Guelph’s urban forest has been in the works at city hall for over a decade now yet progress has been slow to say the least. In the meantime more and more trees are lost from our urban landscape. For more on this important issue, visit the Guelph Urban Forest Friends website at www.guffguelph.ca. Royal City Rag will again focus on environmental issues on March 25. This past weekend we attended the launch of Guelph’s urban farming initiative Backyard Bounty at the Evergreen Centre. We’ll start the show with some excellent interviews recorded at the event. Later on in the show we’ll be talking about trees and why it is important that the City of Guelph enacts a strong bylaw to protect and develop Guelph’s urban forest canopy. On Monday we spent a gorgeous morning in the Arboretum with manager Ric Jordan and Guelph Urban Forest Friends‘ Norah Chaloner and Judy Martin. Its a great interview. Don’t miss it! Listen live on CFRU 93.3fm, Guelph’s Campus Community Radio Station or, after the fact, via the website. Bunny Safari and Goldie Sherman joined us in the studio to talk about the upcoming Guelph Pottery and Sculpture Festival taking place Saturday and Sunday , September 13 & 14, from 10 a.m. to 5 p.m. at The Arboretum Centre at the University of Guelph. An opportunity to view the artistic creations of over 30 Potters and Sculptors from Guelph and all over Southern Ontario. 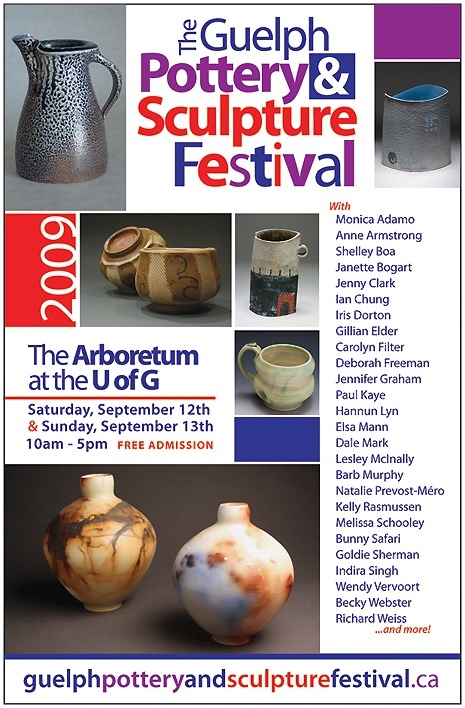 For more information on the festival visit www.guelphpotteryandsculpturefestival.ca. We started the show with Julia Fordham’s “Where does the time go?” from her eponymous album. A song that reminds you about the tick-tock of life and how its best not to waste the time we have. Food for thought for all of us. We also played an obscure John Denver song, “The Potters Wheel” which even for his oeuvre is a challenge to get through. An abrupt switch to a new Conor Oberst song “I don’t want to die in the hospital” was used to remind us that we need to support the Ontario Health Coalition’s campaign to protect Medicare as we know it, and join the rally at Metro Hall in Toronto on September 27th. There’s a free bus going from Guelph. Visit The Big Umbrella at Guelph Farmer’s Market for more details. Don’t forget to catch James Gordon, Sue Smith and Jeff Bird at the Sue Richards fundraiser.